There is a big concern with Parkinson’s about dopamine…is it there? is it depleted? is is flowing? This concern about dopamine brings many people to a place of fear and doubt. When doing the Parkinson’s Recipe for Recovery®, if symptoms seems a bit worse, fear creeps in and brings its friend, doubt…is this really working for me? is my dopamine really there? Simple answers: Yes. Yes. Well, last week, our friend Laura in Canada sent me the article I reference above. Thank you Laura for sharing this wonderful news. It is from the University of Copenhagen in Denmark. 1. This report comes as no surprise as I, and so many of you, are living proof that our dopamine is not depleted. However, it is very exciting that there is now is scientific proof that we have been correct all along. “You have the power to heal yourself.” Marie did. Pratima did. Betty did. And you are. It is a year after this study was published, and nothing has surfaced to challenge its accuracy. When fear brings it’s friend doubt to the party, have your bouncers, Faith and Hope, show fear and doubt to the exit. They need not ruin the party. I had a bad car accident years ago, never could get myself back good. I went to the Doctor the other day, found out I had Parkinson. I say, thats probably why I could never get much better, then recently I went to the Doctor. Now that I know what it is, I can fight this better. The chant has helped already and the exercises are going to help. You said look forward when you walk, I’m trying. I just found your page the other day and I want to thank you for putting yourself out here. Welcome, Jane. I’ve been following the blog for only a couple of months myself but I’m finding Howard’s guidance and the group’s support incredibly helpful. Yes welcome Jane to the natural way of healing the whole self from Helen inAustralia ITS SO GOOD Howard set up this blog for all of us to share and be a support and be inspired. Thanks Karen and Helen, and yes I’m glad this group is here. Yes!!! 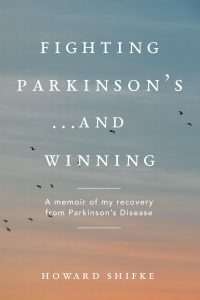 great article Howard and very informative and the God’s honest truth Parkinson’s disease can be cured there is no doubt about it. Once you correct the problem that caused the Parkinson’s disease in the first place then your Parkinson’s recipe will heal all of us. Thanks for this blog Howard! the anxiousness which exacerbates my condition. gives us. I Feel Good………………….. I really believes that dopamine is not depleted on PwPs as Howard explained. I can attest it on myself as I have really good days when my PD symptoms are almost non-existent. I can remembered that day, last August 4 afternoon, all my symptoms were gone until the next morning! Just yesterday, I can feel 80-90% reductions of my PD symptoms. I’m experiencing also the increase of tremors during my Qi Gong practices. So, what I’m trying to say that if dopamine is depleted/not flowing, we should not be experiencing the swings of symptoms, it’ll will be constant. Just my thought. Great post Jimmy, that makes a lot of sense to me too ! It just confirms what Howard has been telling us all along! I too have good days and bad days but most of the time I feel healthy in spite of my outward symptoms! Recent blood test Confirms that all is functioning in the normal range. I just wish that I could get that dopamine valve to begin flowing again! I have been doing the recipe for two years ! My body is healthy, my soul is healed, still working on my mind. Not sure how to heal my electrical impulses though! Howard, could you expand on that! Great post. I have always thought that I had dopamine but that it wasn’t transmitting properly. I actually have felt worse whenever I have tried supplements, such as macuna. It feels like it’s putting more pressure on an already log jammed, or blocked transmission of the dopamine. Thanks for your constant reminder that faith is what heals. Hi Cynthia, I can very much relate to what you say about your legs feeling heavy – for me it’s when I’m walking. I try to remind myself there’s nothing actually wrong with my legs – it’s more a case of the instructions not getting through from my brain at the moment. I have short periods of time when I can walk almost normally and that’s a real treat. Occasionally I find it easier to walk, or even semi-run, almost on my tip toes – I don’t know whether this is a good idea or not. Does anyone else experience anything similar? The heavy legs are to much, it’s with me all the time. I walk about a half mile every day even so. Yes my balance is a mess, but I walk any way. And do the recipe since I found it a few days ago, I never realized how bad my neck was until Howard’s exercises. I have school age children and I have to try to get better. I apparently had this for a while but it just now started making life bad, with symptoms added. I want us all to get better, thanks for this blog. HI Cynthia Yes my legs are always heavy and stiff they feel like bags of cement to lift but I keep doing the recipie a few years now, I feel good in myself accepting my condition and working on healing on all levels . i am very grateful for this life and the joy i feel. Also for Howard and all of you Warriors. Slow and steady. Thank you Howard for this information. The doctors are full of doom and gloom and it is so helpful to know the truth no matter what the doctors say. Blessings to everyone. Don’t ever give up! Thank you Anita, Helen and Karen. Me too with the legs got really worse but strangely feel better. Do suffer hugely in public gaze. I am with you Jane me too with young child it is hard but I think we age all doing really well.